Former Military President, General Ibrahim Babangida (rtd), yesterday, explained how he escaped death during the Gideon Orkar coup in 1990. “I can remember very well that I had some loyal officers, who were supposed to be my protectors and my bodyguards. Initially, they told me to leave but I told them no, I am not leaving anywhere but they remained steadfast and later I took my family outside Dodan Barracks and joined my guards,” he said at an interactive session with journalists in Minna, Niger State ahead of his 74th birthday anniversary. 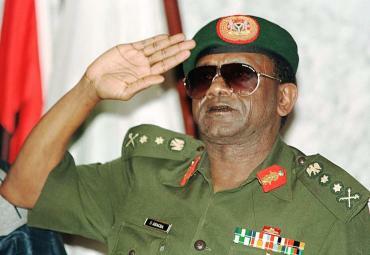 “I, Lieutenant-General Sani Abacha, Chief of Army Staff, Chairman, Joint Chiefs of Staff, have found it necessary to address you once again in the course of our nation’s history. In view of the unfortunate, development early this morning, I’m in touch with the CGS, Service Chiefs, GOCs, FOCs, AOCs, of the armed forces and they have all pledged their unflinching support and loyalty to the federal military government of General Ibrahim Badamasi Babangida who is perfectly safe and with whom I am in contact. “Early this morning there was sporadic firing by a few disloyal and misguided soldiers in some isolated parts of Lagos, followed by an embarrassing radio broadcast. ‘Most of these disloyal elements have been arrested and are already undergoing interrogation. The remaining dissidents are advised in their own interest to report to the nearest military location and hand over the arms and ammunition in their possession. All formation and unit commanders are hereby directed to exercise effective command and control. “At this stage, let me reiterate our commitment to pursue vigorously the transition programme. No amount of threat or blackmail will detract the federal military government’s attention in this regard. We are set to hand over power to a democratically elected government in 1992. I wish to assure all law-abiding citizens that the situation is now under control and people should go about pursuing their lawful interest. “Long live the Federal Republic of Nigeria. “Fellow Nigerians, I salute you all, first and foremost, let me assure you further that the unfortunate situation of this morning in some parts of Lagos has been brought under control by loyal troops as earlier stated by the chief of army staff and chairman, joint chiefs of staff, Lieutenant-General Sani Abacha with whom I have been in contact and he is with me this evening. “I also want to seize this opportunity to commend all members of the Nigerian armed forces the Nigeria police and security agents for the gallant and professional manner the situation was contained. “Let me also congratulate the civil populace for their continued support for this administration. I wish to state that all law-abiding citizens should go about their normal duties and their safety guaranteed. Let me also assure the diplomatic community and all foreigners in the country that the security of their lives and property is hereby guaranteed. President Goodluck Jonathan Spent $1million Of Aid Money On Beyonce And Jay Z?